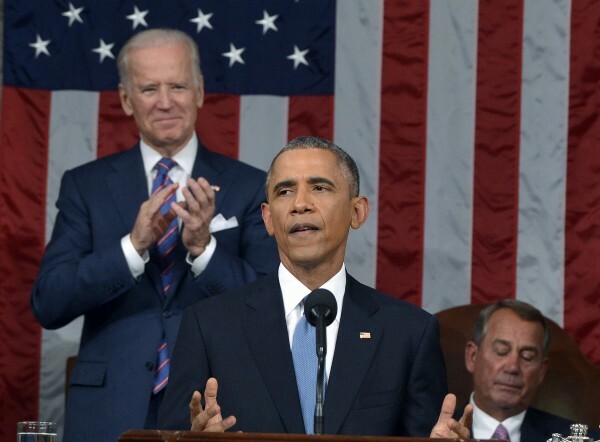 President Barack Obama delivers his State of the Union address to a joint session of Congress, as Vice President Joe Biden applauds and House Speaker John Boehner, R-Ohio, listens on Capitol Hill in Washington on Tuesday. WASHINGTON —President Barack Obama challenged the Republican-led Congress on Tuesday to break out of the “tired old patterns” of confrontational politics and back an effort to lift the middle class, with higher taxes on the rich and trade deals. Dogged since the start of presidency six years ago by an ailing economy, Obama appeared before a joint session of Congress and millions of Americans watching on television to declare that his policies have paid off with an economic revival that has trimmed the jobless rate to 5.6 percent. It is now time, he said, to “turn the page” from recession and war and work together to address those middle-class Americans who have been left behind. His State of the Union speech was at times conciliatory in calling for a spirit of compromise but also defiant — making proposals that are anathema to Republicans and vowing to veto any Republican effort to roll back his signature healthcare law or his unilateral loosening of immigration policy. Many of the proposals outlined in Obama’s address, while popular with many Americans, are unlikely to become reality, given Republican opposition and the fact Obama will soon become a lame duck as the county turns its attention to the 2016 campaign to succeed him. But his proposals for wealth redistribution could serve to shape the political debate around the next White House election and could help former Secretary of State Hillary Clinton, the overwhelming favorite for the Democratic presidential nomination if she decides to run. “The middle class issues the President talked about, like paychecks, jobs and college expenses, are the issues that working families struggle with on a daily basis. Paid sick leave, making college more affordable and closing loopholes for wealthy taxpayers should be issues that everyone can get behind.” Rep. Chellie Pingree, D-Maine, said in a news release. On foreign policy, Obama defended his decision in December to seek to normalize relations with Communist-ruled Cuba and urged Congress to lift the more than 50-year-old U.S. economic embargo against Havana. He called on lawmakers to pass a new authorization of military force against Islamic State militants to replace powers that were given to President George W. Bush to prosecute the Iraq war. Lawmakers waved yellow pencils to show their support for free speech when Obama mentioned the attacks earlier this month in Paris. The 17 people killed by Islamist militant gunmen included staff at French satirical newspaper Charlie Hebdo. Obama, reprised a promise he made when he first took office and vowed an unrelenting effort to close the U.S. military prison at Guantanamo Bay, Cuba, where foreign terrorism suspects have been held since 2002. “It’s time to close Gitmo,” he said. He said he would block an effort to increase sanctions on Iran while negotiations with Tehran on reining in its nuclear program unfold. Obama had a message for both Democrats and Republicans on trade, where he wants to complete trade deals with Asia and Europe to create more export-related jobs. He urged Congress to give him trade promotion authority, the power to negotiate free trade deals. Democrats have opposed giving him the power, fearing the deals he makes will hurt American labor. The core of Obama’s plan to boost the middle class is to raise taxes on the wealthiest Americans by $320 billion over the next 10 years to pay for expanded tax credits and educational benefits for the middle class, including two years of free community college. The idea of raising the top capital gains and dividends tax rate to 28 percent from 23.8 percent is popular with Democrats who are looking beyond Obama’s tenure to the 2016 elections. In appealing for higher taxes, Obama blamed lobbyists for the current state of the tax code, saying it is riddled with loopholes that let some corporations pay nothing. “They’ve riddled it with giveaways the superrich don’t need, denying a break to middle class families who do,” he said. But the proposal seems dead on arrival given opposition from Republicans. “Let’s iron out loopholes to lower rates — and create jobs, not pay for more government spending,” said Iowa Republican Senator Joni Ernst in excerpts from remarks that were to be the official Republican response. For Obama, seeking to burnish his legacy, Tuesday’s speech will be his best opportunity of the year to talk to millions of Americans about the improved economy. When he first took office in January 2009, the country was in the grips of a crippling financial crisis.